If facing Mitchell Starc and Pat Cummins were hard, the Sri Lankans will be given a double dose of hostile fast bowling as South Africa’s menacing four pronged attack awaits them. Dale Steyn, Kagiso Rabada, Vernon Philander and Duanne Olivier maybe not as threatening as Malcolm Marshall, Michael Holding, Joel Garner and Colin Croft but to a side whose deficiencies of playing short pitched bowling was badly exposed; the South African challenge will not be a pleasant one. The national cricket team landed in South Africa yesterday in two batches. The players who were involved in the Test series against Australia flew to Johannesburg from Sydney while the others took a flight from Colombo to the South African capital before flying to the coastal city of Durban where the first Test match will be played. The Sri Lankans are lucky that the Tests are taking place in the eastern coast with Port Elizabeth scheduled to host the second Test and not the Bull Ring in Johannesburg or Newlands in Cape Town on the western coast, venues where fast bowlers have dominated over the years. But yet, expect spin to play little role in the series. The Proteas were given dustbowls when they toured Sri Lanka last year and Dimuth Karunaratne’s side can expect a taste of their own medicine. Dean Elgar, the South African opening batsman during the series in Sri Lanka didn’t face one ball of seam as spin was introduced with the new ball and this time around the tourists can be sure to play little spin over the two Tests. Both these venues are happy hunting grounds for the Sri Lankans. Their only Test win on South African soil came in Durban eight years ago while they have done quite well in ODIs at Port Elizabeth. St. George’s Park in Port Elizabeth doesn’t offer much bounce as some of the other venues. The Sri Lankans will also play five ODIs and three T-20 Internationals after the two match Test series before returning home after being on the road for four months. Since December, they have played in New Zealand, Australia and now South Africa and such scheduling has been demanding on the Sri Lankans. Batsmen who scored heavily in domestic cricket have been called up for national duty and it remains to be seen how they will take on the strong South African side. 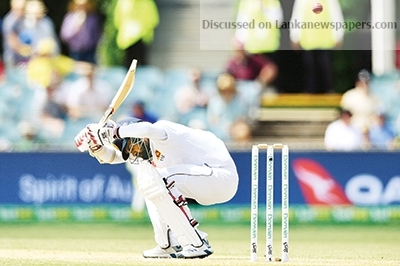 The Island’s coverage of Sri Lanka’s cricket tour of Australia is sponsored by Fairfirst Insurance.